Heat 2 inches oil in a large pot till popping. In a shallow bowl, stir together the ground cinnamon and sugar and set aside. In a small bowl, whisk together 1 cup of confectioners' sugar, 2 tablespoons of milk and 1 teaspoon of vanilla extract, set aside. This is the vanilla icing. In another bowl, whisk together 1 cup of confectioners' sugar, 1/4 cup of cocoa powder and 3 tablespoons of milk and set aside. This is the chocolate icing. Lay out the biscuits on a cutting board and with a 1 1/2-inch round cookie or biscuit cutter, cut out a hole from the middle of each biscuit. Once the oil is hot, fry them in the oil until golden (About 1-2 minutes) and then flip with tongs to fry the other side. 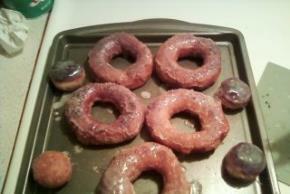 You can even fry the donuts holes. Drain on paper towel and then toss in the cinnamon-sugar and icing. You can decorate with sprinkles, as desired.